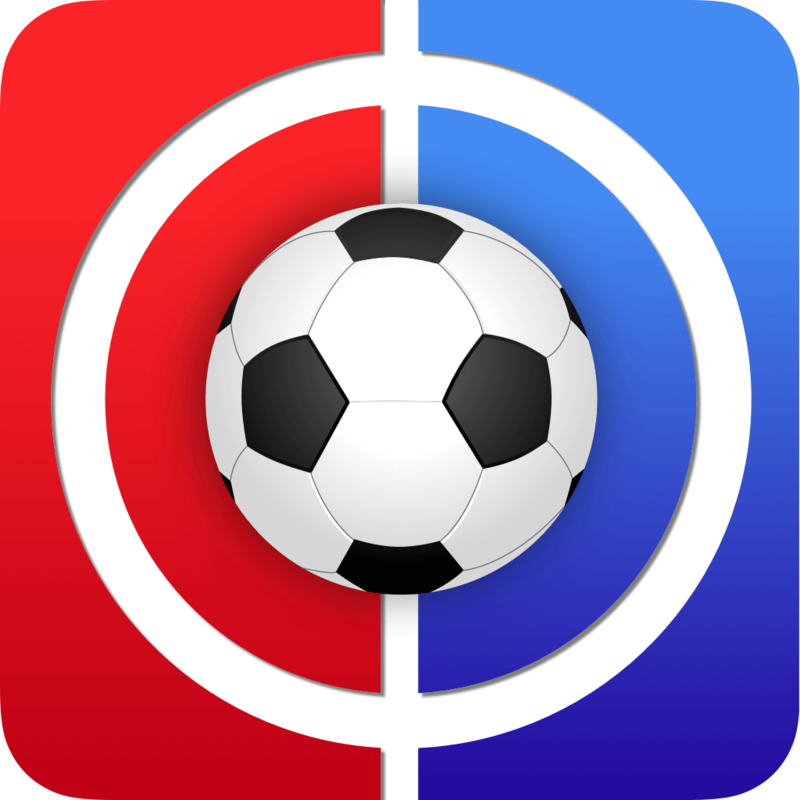 Welcome to the FF247 Fantasy Football Site Team GW14. Oh dear! Our fine run of green arrows was halted in inglorious fashion as we managed just 39 points last week which saw us come crashing down the rankings by 20k to land in 58,159th. We missed the overall average by 11 points, which is never a good sign. The fact that only 3 of our original starting 11 scored over 2 points probably tells you all you need to know. Just as well we had such a strong bench then as Lucas Moura didn’t see the pitch at all in GW13, and like many, Obi Wan subsequently lit up his light-sab(v)er and came to the rescue once more. Our bench was weakly tickled in the comments last week, and possibly rightly so… (it is what it is due to many weeks of battling against the need to play an early wildcard), we only wish we could have also called upon Tomkins too! Our decision making last week was a bit off as the double up on Wolves transfers failed miserably and Captain Richarlison didn’t exactly do us proud. 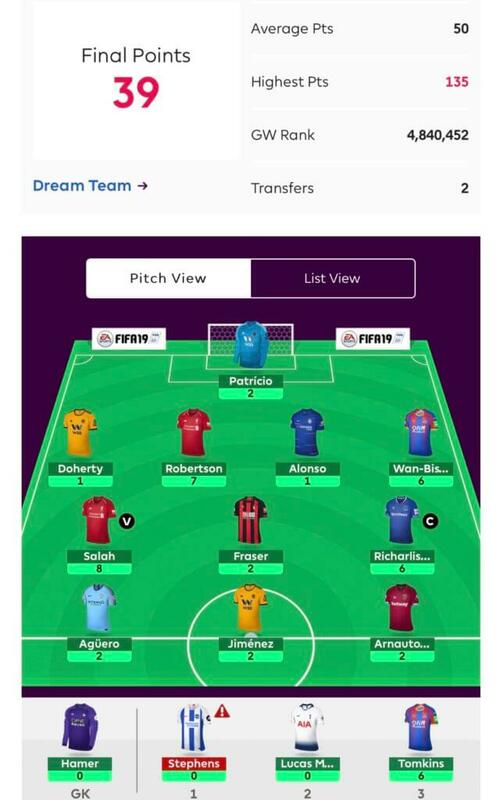 Let’s go see if we can do any better this week and get ourselves back on the green track, we have 1 free transfer available and a huge bank balance of £4.8m, aka ‘Hazard’ money…. 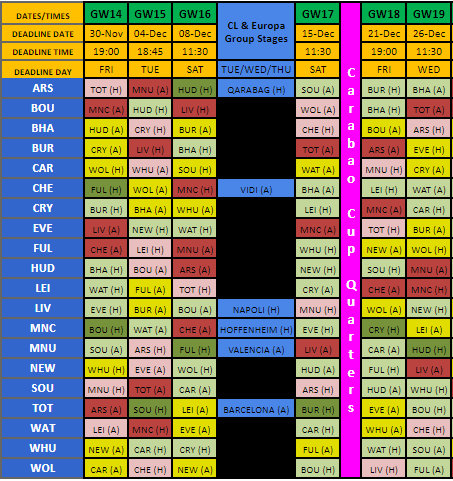 It’s long been told that Spurs’ fixtures turn for the better come GW15 and this does indeed seem to be the case with Southampton (H), Leicester (A) and Burnley (H) as their next 3 after this weekend as well as then facing Bournemouth and Wolves at home and Cardiff away over the Christmas period. But how on earth can we afford a 2nd premium striker without killing half of our midfield and 2 of our defenders? Truth is we probably can’t and so we need a sacrificial lamb and that comes in the shape of Aguero for us (*gulp). 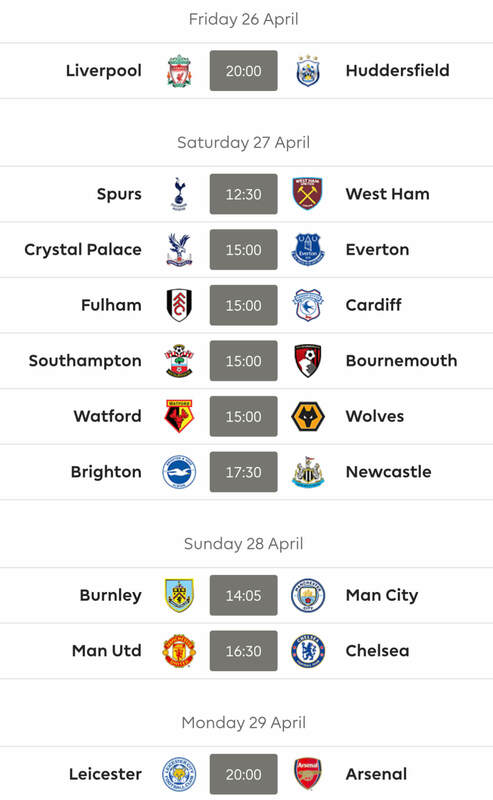 When we delve into his fixtures versus the Kane ones above we see that he has Watford and Chelsea away after this week followed by a potentially challenging Everton tie, albeit at home. Kun has been a bit ‘meh’ away from home whereas we can see Kane being captaincy material in a good few of his games. But of course, before Aguero exits stage left, he does have the small matter of Bournemouth at home this week and we all know how devastating both he and City can be at The Etihad and so he gets a one game stay of execution before we bring in Kane in midweek. Kane is of course more expensive than Aguero (£0.9m in our case) and in order to accommodate him we couldn’t afford to bring in Sterling, or indeed Hazard this week. Instead we have turned our intentions to a ‘budget’ City mid in the form of Leroy Sane. At about £2m cheaper than the aforementioned duo he has scored 69 points, which on the face of it is much less than their 95 and 83 but his minutes are far less and his PP90 (points per 90 mins) is actually higher at 10.5 to Sterling’s 9.2 and Hazard’s 8.5. This allows us to keep some semblance of City coverage without overstretching our budget and hopefully also double City coverage for this week, assuming Sane plays, which of course is a different story (risk) altogether… The fact that we had to even resort to PP90 says it all in terms of possible rotation but we do feel that with Mendy out for the foreseeable he will see more minutes as that natural width on the left is absent without either. Indeed, last time Mendy was out (GW’s 5 – 7), it was no surprise, or probably coincidence, that Sane started all of those, just as he did last week with Mendy being out once more. 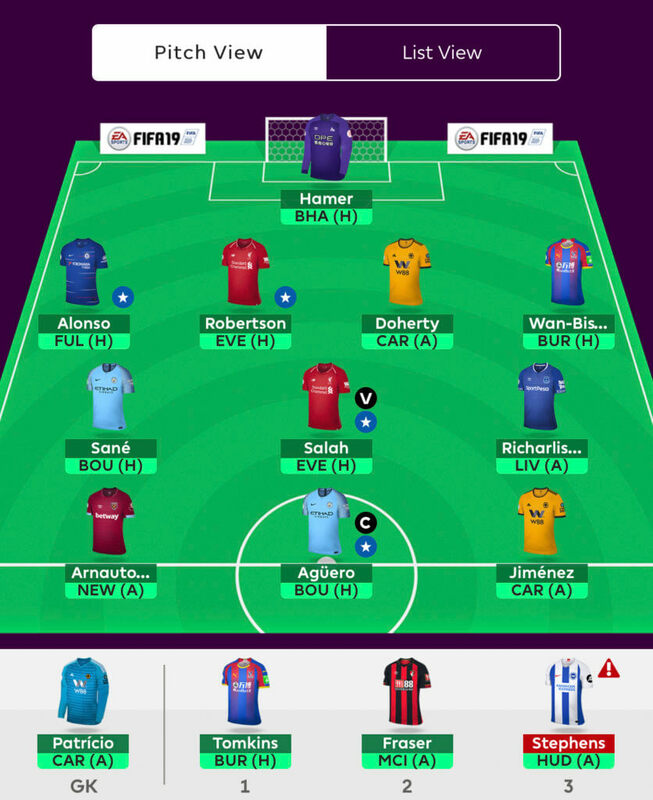 We did briefly consider keeping Lucas Moura and ditching Ryan Fraser instead as like Kane and Kun their fixtures are very contrasting but with Moura now having Son et al nipping at his heels, and with Sane coming in, we felt that having 2 possible rotation candidates may just be a stretch too far. This was unanimous, not a single vote went elsewhere. The only query raised was “What’s the word on Jesus?” and the inevitably mature responses included “Doesn’t exist” and “He’ll be around on the 25th (of December), wouldn’t expect to see him any earlier”. Let us pray that he doesn’t appear this week then, and if he does then Salah has got our vice-captaincy, again this was unanimous, just for the record. just got back. gutted to see murray benched but I get doherty’s precious 7 and whatever captain salah scores tomorrow.